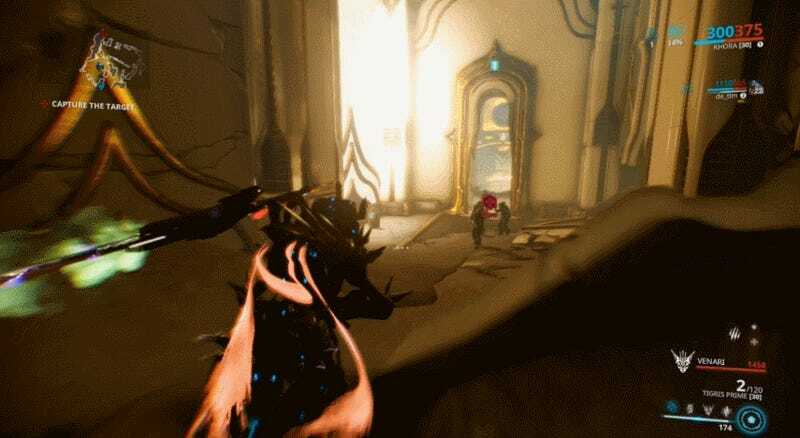 On September 20 Steve Sinclair, Digital Extremes’ creative director, tweeted out that its third-person shooter MMO Warframe had just gotten faster, decreasing latency by one millisecond to be precise. That was thanks to the work of Panic Button, an outside studio that in the last few years has focused on porting other companies’ games (Rocket League, Wolfenstein II) to the Nintendo Switch. 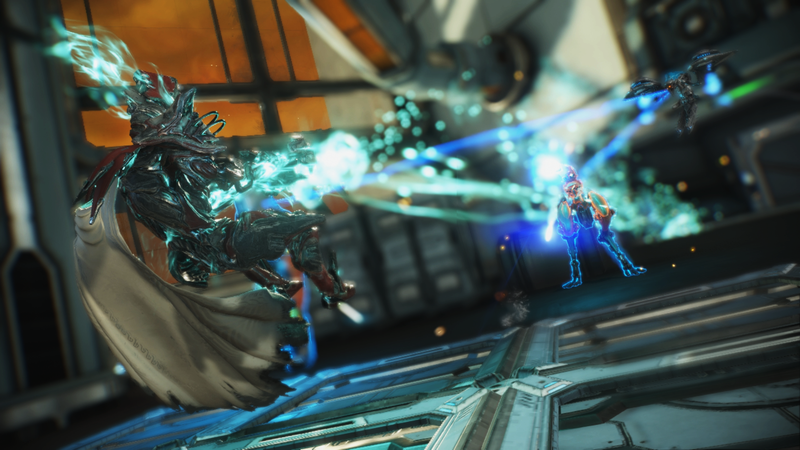 Panic Button has spent the last nine months helping Digital Extremes do the same for Warframe, making small improvements along the way that ended up benefiting the game on PS4, Xbox One, and PC as well as Switch. I brought the tweet up to Digital Extremes’ assistant producer, Mark Ollivierre, and Panic Button’s general manager, Adam Creighton, when I met them to test out how the sprawling sci-fi epic played on Switch. Ollivierre explained that while Warframe has been updated and improved each time it’s been ported in its five year lifespan, Digital Extremes didn’t expect improvements to be made by an outside company that wasn’t deeply familiar with the game’s development and underlying architecture. Saving one millisecond won’t dramatically change how people play Warframe, but it’s an indication of the diligence and expertise Panic Button applied to the game’s Switch version. In my brief time with an in-progress build of the game, this came through in how much the Switch version played like other console versions. Warframe on Switch runs at 30 frames per second at 720p, whether docked or in handheld mode. The game won’t support the Switch’s video recording feature because, according to Creighton and Ollivierre, there was simply no processing left over to spare for it. We tooled around Venus for a couple of standard hacking missions. Everything seemed present and accounted for. Twitchy gunplay? Check. Super-sensitive camera movements? Check. Gorgeous sunlight cascading through the falling snow? Check. If you’ve played Warframe a ton on PC, you’ll no doubt find small things to quibble with about the Switch version, as players have with all of the console ports (and as PC players are wont to do in general), but visually and in terms of gameplay feel, no corners really felt cut. The version of Warframe arriving on Switch on November 20 will be the summer PC build of the game from right after the Mask of the Revenant quest line was added. That means that while it will include Plains of Eidolon, the game’s first shared open map space, it won’t include its second from the Fortuna expansion released earlier this month. Console versions of Warframe have always lagged somewhat behind the PC version in getting the game’s latest new content, so that’s not a surprise. Digital Extremes’ director of public relations, Doug Perry, told me that with Panic Button’s help, the plan is for the Switch version to be caught up to PS4 and Xbox One by early 2019, with all three versions of the game getting updated at the same time from there out. The Switch version will also follow the other two platforms’ cycle for new Prime exosuits being added to the game for purchase, starting with the Mesa, Mag, and Chroma Primes. PC players will also have a short but as-of-yet unspecified window of time in which to migrate their accounts to the Switch version, as was the case when the game came to PS4 and Xbox One. That’s another way of saying that Digital Extremes hasn’t yet solved the problem of shared progress and cross-play. Unlike Fortnite, Switch players will be cordoned off from their PS4, Xbox One, and PC friends, and if you’re migrating to the game from either of the other consoles, you won’t be able to port your progress over, but will instead have to start from scratch. As a cooperative loot-based shooter, multiplayer is key to Warframe, and the Switch version will support parties of up to four players with full voice chat, no fiddling with Nintendo’s voice chat app required. Similarly, Warframe also won’t require being subscribed to Nintendo Switch Online. Whether Digital Extremes will collaborate with Nintendo on any Switch-exclusive content in the future remains to be seen. As of yet, Perry could not confirm any plans for a Warframe amiibo or Link-inspired exosuits. Warframe also supports motion controls for aim-assist like in Fortnite and Splatoon 2 as well the pro controller, which while not necessary for average grinding activities, might be preferable for more challenging activities given the ongoing shortcomings of the Joy-Con thumbsticks. While the lack of precision they afford is a tradeoff I’m happy to make in exchange for being able to play Warframe anywhere, the frenetic shooter is yet further proof that whatever Nintendo plans for the device’s redesign next year, higher-quality Joy-Con should be near the top of the list. The Switch’s meteoric rise throughout last year has made it a destination for all sorts of games, old and new, good and bad, with the increasingly cluttered eShop as proof of that. Digital Extremes’ collaboration with Panic Button isn’t just low hanging fruit, though. After all, Panic Button managed to get Doom 2016 working decently enough on the Switch. Warframe is an overwhelming game with a ton of small, interlocking systems and progression paths, and we’ll have a much better idea how all of those play out on Switch once the port launches next week. But my short hands-on time with the game convinced me it’s worth checking out more.